We’re here to tell you it doesn’t have to be like this. 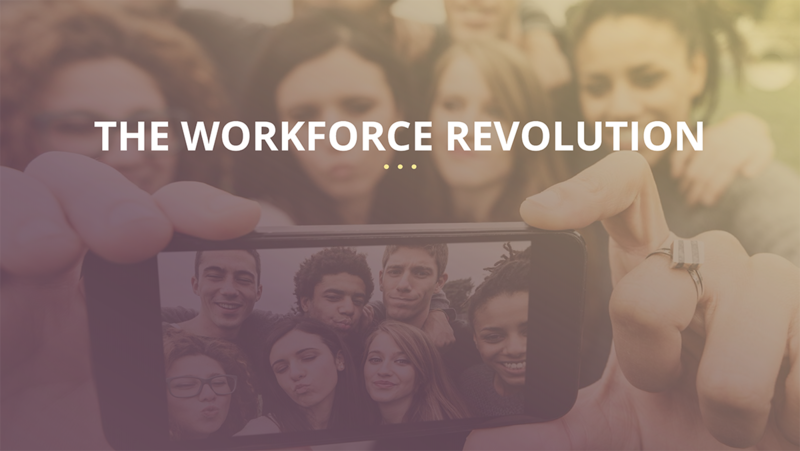 We’re ready for the Workforce Revolution - are you? Download are free Workforce Management guide below and take the first steps.The Workforce Revolution is underway, the question you need to ask yourself is - are you ready for it? But first, let’s take a step back. Why is it a revolution and why does it matter? Revolution is a big word but it’s something we believe is happening right now in every workplace and every industry. And the changes we’re witnessing are so big, it should be called a revolution. It matters because, if you’re not ready for it, you stand to lose your competitive edge by either standing still or going backwards. Being successful isn’t just about reaching your customers and delivering an amazing experience for them, it’s about doing the same for your employees too. By having great employee experience, you can increase employee engagement and stay much more relevant to your employees, especially when you embrace digitalisation. Happy employees who love their job and where they work will give you happy customers who love your business. The average person picks us their phone 280 times a day and this number is growing. Think about it this way: the majority of your employees bring a supercomputer to work that they can fit in the palm of their hand and slip into their pockets. Sure, each company has its own device policy and there’s no denying that smartphones can be a distraction but this is what your employees use all day, every day. As an employer, it makes perfect sense for you to interact with them in this environment and use it as your primary communication channel. Two of the beliefs we’re driven by at Quinyx is that software needs to be simple and the end users need to be engaged - that way it delivers so much more value. It’s why Quinyx is a mobile-first workforce management solution. The feedback we hear from the end users who use Quinyx is many of them check Quinyx on their phone before they check their social media because through it they can see when they are working, keep up to date with any work-related information that’s relevant to them and update their shifts and availability if they need to. And with the rise of voice assistants and mobile tech, this widespread use is going to grow exponentially. Be where your employees are and use mobile technology to enhance your employee experience. Millennials are flooding the workplace, so much so that by 2020 more than 50% of the workforce will be Millennials. This is important because Millennials bring with them a new way of working. They are much more individualistic, they are willing to switch jobs frequently and they have different expectations. They have powered the gig economy and welcome the idea of working whenever and however they wish. Far from being a negative, as an employer this opens up the possibility of having a perfectly flexible workforce that’s there when your customers need them. The third component of the Workforce Revolution is big data. You’ll all have different KPIs for your businesses but now you have the ability, through the analysis of different data and metrics, to control and optimise the way your business runs in real time. For example, one Papa John’s store who use Quinyx as their workforce management solution saw a 5% reduction in labour cost in 12 weeks because they were able to use data to forecast more effectively. There’s nothing stopping you from making better, data-driven decisions, to keep that competitive edge. There are countless challenges facing businesses like yours. To name but a few, you have Brexit, rising labour costs, tougher competition, GDPR, outdated systems, more demanding customers, low employee retention, manual processes and employees telling you how unhappy they are.